Hello and happy 11/11/11, vintage lovers!!! This week I had the opportunity to connect with and have an enlightening phone chat with a truly talented & seasoned vintage seller, Carmen & Ginger on Etsy. I advocate buying vintage from independent sellers — whether in a brick or mortar or an online shop like Carmen & Ginger — because you have the opportunity to work piece-by-piece with a talented vintage lover who can personalize your shopping experience so that you’re left feeling stylish AND satisfied. One of the inherent issues with vintage is that when examined as a standalone piece, a vintage dress, blouse, skirt, etc. can seem “odd” without the right shoes, bag, accessories and most importantly: Attitude! Part of the vintage lovers’ attitude is a willingness to experiment so that you know what works for you in vintage. This attitude also creates an appreciation for the vintage sellers of the industry who deserve so much respect for what they do, and who want you to ask them as many questions as you please and to understand the pro/con realities behind buying vintage clothing. Carmen & Ginger inspired me to write today’s post because she reminded me of a few things about vintage that even I take for granted or fail to prioritize — and that you may, too! The #1 thing we may take for granted in vintage? The hard work that goes into the “hunting & gathering” process of finding vintage pieces to sell to vintage lovers who may not have the time or energy to dig in the wild world of fashion themselves. 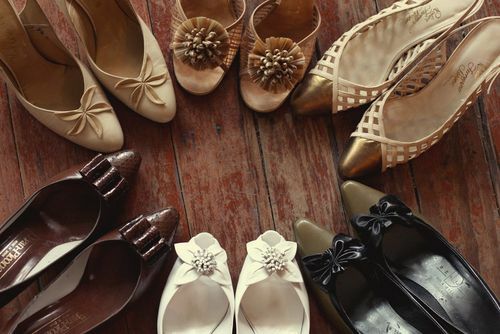 Keep reading after the jump for 5 gentle reminders of things every vintage seller wants you to know — and how taking these suggestions into consideration will make you a happier, healthier vintage lover! Today’s inherent power in the numerical value of the day — 11/11/11 — is an awesome motivation for me to approach my day (and all days forward!) with courage and confidence. Because who knows your style better than YOU? Who wakes up everyday in your skin, with your mind, health & wealth? YOU! 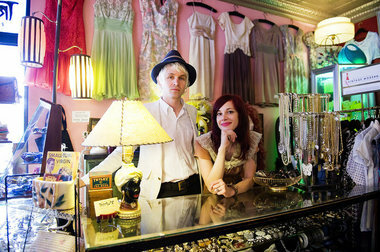 Vintage sellers are a bit like medicine men when it comes to vintage fashion. They use their talents to find these precious pieces, and they want to pass along their positive style vibes to you. When you’re attracted to them thanks to energy, they are there for you to inspire motivation to seek what is best for you. Thank you for seeking vintage fashion as a conscious fashion choice for your lives, vintage lovers! Have an inspired day and weekend — looking forward to seeing some of you in this weekend’s live video chat, stay tuned to Twitter & Facebook for further details! THE PROBLEM: Because there have and are no official standards for sizing, even when a vintage piece has a tag with a numerical size on it you cannot trust that the number listed is equivalent to today’s measurements. In other words, a Donna Karen ’80s blazer may say size 8 but in reality, it fits more like a 4 because of the ’80s sizing standards which are different from today’s normalcy. The numbers that will never change are the specific measurements of a piece and how they compare to your body’s measurements. 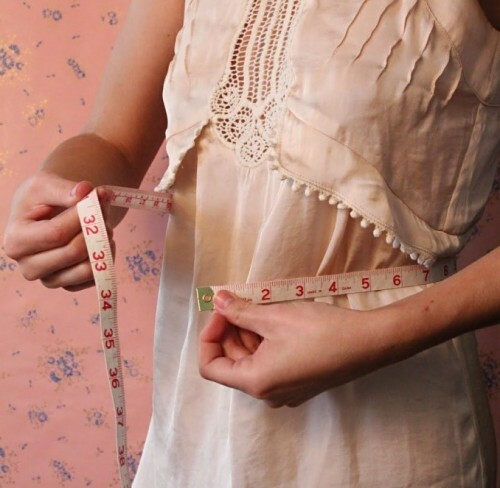 If a vintage dress has about a size 30 waist, 34 bust and a length from waist to bottom of 24 inches, you can use those measurements against your own to see if it will be tight/loose or short/long. If you want something to fit tight, you’ll look for a piece that fits your measurements almost exact. For a bit of give? Add an inch. With practice, you’ll find perfection — but you have to know your measurements first! THE EDUCATION: When women were selling most of their clothing up until the ’70s when the trend of using patterns to make clothing at home waned, we knew our measurements to the tee. We simply HAD to in order to create the clothing of our dreams! My grandmother made all of her own clothing in college, and you bet she knew all the specifics of her measurements, down to how big her armpit was! Here’s a quick video tutorial on taking your body’s measurements. (Click here for waist, inseam and front body measurements). The basics are waist, bust, arm length, torso length and inseam, which is the “crotch” area of pants. You may also want to know your leg length for a high-waisted and regular-waisted pant fit, along with length of a dress from waist to bottom to learn if it will fit mini, at the knee, midi or maxi. CUSTOMER’S BENEFIT: Sometimes sellers don’t realize the value of listing measurements of a piece. They may be newbies in the field and simply list the size listed on the vintage item’s tag, mistakenly thinking that size is in fact representative of the piece. Much like they say we all must be “defensive drivers,” we must also be defensive vintage buyers, too. So if you are interested in a piece and there are no measurements listed, email the seller and request that they provide the piece’s measurements. You’ll actually be doing good for the vintage industry by asking them to list measurements with their pieces! This is not a critique of their listing but rather an educated request that will inspire them to be more trustworthy vintage sellers. Your benefit? You’ll know for sure if that vintage piece is going to fit! THE PROBLEM: Whether you are a vintage lover new or old, sometimes we forget the reality of what vintage is: secondhand style. Used clothing. And dare I say it? OLD! So, what are the realities of those not-so-very-nice descriptors of what we all love? Well first, vintage clothing is simply not new clothing. The mix of wear, time, transport and multiple try-ons (particularly in a store) mean that there can be snags, tears, scuffs, marks and the like. THE EDUCATION: Carmen & Ginger spoke to me about this issue, that every now and again one of her customer’s will receive a piece of vintage sold from her shop and comment that it’s not in the best of condition. While it’s up to vintage sellers to list these details of a piece, it is also up to the consumer to absorb what these details mean. If a vintage seller says that shoes are in “good vintage condition” but does not list what that means in the description, please email the seller and request to know what might be “wrong” with the piece. Perhaps it has been washed a few times and has a few pills, or the shoes were worn and you may want to resole them for a fresh start. When you are in the store, you can obviously see for yourself the quality of a piece. But keep in mind that what you are seeing is a secondhand piece and that if fabulous enough, you have something to wear and give love whether through alterations and repair or simply re-imagining it in a new, modern way. CUSTOMER’S BENEFIT: With an understanding that vintage is not in perfect condition, you manage your expectations AND empower yourself to ask the questions to get the education you need before buying a vintage piece, particularly online. When in a vintage brick & mortar, you know that a spot here or a snag there is not a reason to turn away from a vintage piece you love. There are some great capes in my store A Little Wicked that have some stains on the lining inside of them. Will anyone EVER see those stains but you? No! Are capes SO gorgeous and trendy right now, and when purchased vintage, one-of-a-kind pieces of topnotch quality costing 1/2 to 75% less than what you’d buy them for in a department store? YES! 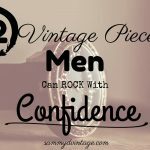 Managing your expectations around the realities of vintage will also lend itself to aiding a happier, healthier vintage shopping experience. You won’t become frustrated when that “showstopping piece” has something wrong with it. Instead of looking at a missing button as an obstacle, look at it as an opportunity to learn how to sew a button or even ask for a small discount from the seller to encourage sales of the piece! I admit that this is a frustration experienced by me personally. Every now and again, a new customer will walk into A Little Wicked and ask to me, “Is this a thrift store?” With almost a defensive edge to my voice I will reply, “It’s a vintage store, we’re edited for style and quality here so that our customers know they’ll love what’s in the store and return for great fashion time and time again.” Not those words exactly, but you get the point! 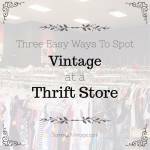 The confusion of “vintage” with “thrift” is a big one depending on how experienced you are with the vintage brick & mortar industry. 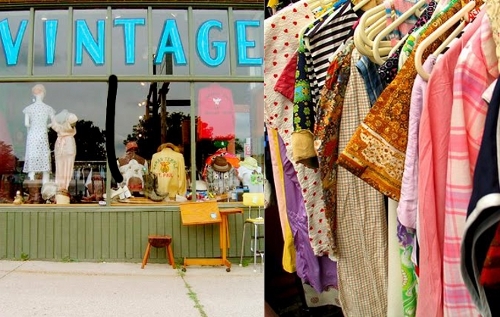 In some areas of the country and undoubtedly of the world, there are no “edited vintage boutiques.” You find your vintage in official thrift stores. So it makes sense that there is a confusion with the terminology. And in the customer’s defense, when you are used to buying vintage at “thrift prices” in your Goodwill or Salvation Army, Savers, Thrift Village or the dozens of other thrift store chains in the US, you would be a bit shell shocked walking into a vintage store or buying vintage online and see how marked up the prices are. THE EDUCATION: A vintage store will usually (note: usually, because I have seen a few do this) have “thrift” in their names. Vintage boutiques are personalized shopping experiences that speak to the style tastes of the owner, who curates and merchandises their store in such a way that it’s attractive and appealing to his/her customer. The vintage store is named appropriately, too, sometimes referencing to the vintage past or speaking to more modern language. I work at A LITTLE WICKED, but there are vintage stores in NYC called “Reminiscence,” “New York Vintage,” “Dusty Buttons” and “Archangel Antiques” which use more throwback terminology to describe what is inside their stores. One of my favorite vintage stores of all time is MALENA’S, which is the literal name of the owner. You see just how personalized that store is: She named it after herself! You know that when you walk into Malena’s that you will most likely meet the owner and/or have the opportunity to connect with her in some shape or form if you request it. Can you do that in a thrift store? I think not! Thrift stores are a mish-mash of whatever is donated, sold and acquired, most of which isn’t “vintage” at all. Some of them to sift out lower quality pieces from ALL ERAS (mostly modern) in exchange for higher quality ones, but the stores are not truly representative of a personal “vintage brand,” preferring to put what sells on the floor and to mark pieces at cheap prices to move them quickly. Examples of chain thrift stores that sometimes carry vintage in a special section would be Beacon’s Closet, and sometimes Goodwill even categorizes special vintage pieces it receives in a unique aisle. CUSTOMER’S BENEFIT: It’s all about managing expectations so that you enter a store with the understanding of what to expect and how to shop. When you’re visiting a new town and look up vintage stores, know that you will be entering a unique shopping experience that’s fun, fresh and fashionable. When you visit a thrift store, you’re going to dig, get dirty and sometimes get dangerous in your search & seize of the style you want. Thrift stores are not edited, not personalized and not representative of an owner’s love of fashion. I advise all vintage lovers old and new to pay respects to vintage boutiques online and offline by referring to them as “vintage stores” or “vintage brands.” Your appreciation of the industry will translate into a better shopping experience, because you are paying respects to the talents of the remarkable individuals who keep the industry alive by doing what they do! THE PROBLEM: This tip is a#1 suggestion from online vintage sellers, who quite literally implore their customers to ASK QUESTIONS BEFORE BUYING! LOL, apologies for the caps but after receiving quite a few tweets about this suggestion, I felt it was necessary! Before you buy a piece in a vintage shop online, be sure to clarify any questions BEFORE you click to buy. Whether it’s about style, size, shipping or a simple “how are you today?”, use the messaging functionality available to communicate with sellers on Ebay, Etsy, Artfire, Market Publique and other digital vintage marketplaces. This is far from the truth! Sellers want you to buy with 100% confidence and encourage you to ask those questions before purchasing so that if you are on the fence about a purchase and decide not to buy, that you have the information you need to decide against the purchase without second-guessing yourself. CUSTOMER’S BENEFIT: There are a few specific benefits for the customer when he/she asks questions of sellers before buying. First, you know if you want to purchase an item FOR SURE, almost as if you were buying it face-to-face with the seller in the store. Second, the vintage seller will respect you more for your honest questions. They may even send you more pictures of the piece, or grant you a small discount if you are hesitant to purchase because of a concern with wear or tear. Lastly, vintage sellers sell online not to HIDE from the world — but to connect with it! Even if you don’t use the messaging service on an online marketplace, you can leave notes or ask questions through the various outlets of social media. Sellers are on Twitter, Facebook, Google+ … you name it! They love learning who their customers are and what fabulous things they are doing in their lives. In other words, your questions inspire them. 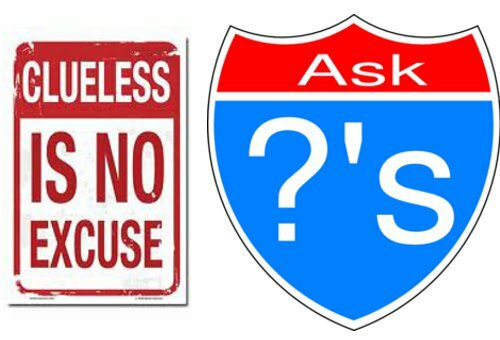 Ask them, because you never know the indirect positive effect you may have! THE PROBLEM: It is understandable that in today’s economy — where no one is getting that “expected pay raise,” people are working without benefits and recent Ivy League grads are still waitressing or babysitting at age 25 — that “getting a deal” and “saving money” are permanently engrained in our collective consciousness. The vintage industry is full of deals … no matter the price. So when a customer asks a vintage sellers for a discount on a one-of-a-kind piece, or scoffs at the price and says, “I can find this for less in a thrift store,” well, let’s just say that negative energy is getting you nowhere both personally, professionally and stylishly. The problem is that oftentimes we forget that vintage sellers are hustling to make a living too. We owe it to the present financial circumstances to recognize that, and to realize that our monetary contribution to their store is helping them to live their lives in a financially stable, sane way. 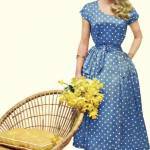 Vintage sellers have their own reasons for marking vintage at the prices they are. And honestly, if you kindly ask them why, perhaps they will tell you that a.) they dry cleaned it, b.) they hemmed it so that it was a modern cut and c.) it was purchased firsthand from a vintage collector in Italy. Woah. Aren’t those extra bonuses that make purchasing what seemed like an “expensive” piece that more reasonable? Respect your vintage sellers by recognizing that they are selling fashion in their best financial interest and that your business is what puts the “bacon” on their tables. You are not in a corporate environment when shopping a vintage store, so your opinions and concerns are better left more positive than negative so that you can work and enjoy your shopping experience to its full potential. I believe that buying a few vintage pieces for $500 is a much better style investment than buying a ton of on-sale-pieces for $500. You’ll have a.) more compliments on the vintage b.) you’ll keep those vintage pieces FOREVER versus the on-sale-from-fast-fashion-chains pieces and c.) you’ll have a much more enjoyable, enriching and energized shopping experience buying vintage. Those aren’t the only benefits: Not only are you investing your STYLE for a lifetime, you are investing in the local economy of wherever you live. You are helping your neighbor to survive, thrive and keep on spreading vintage love! Another valuable and well researched article from SammyD22. 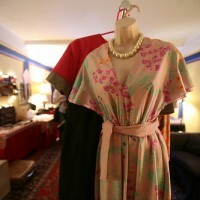 She is an amazing advocate of vintage clothing and leads the pack in reuse, repurpose, recycle. She knows her stuff. Thank you again, Sammy. 1. 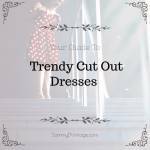 Find a dress in your closet that fits you well and is similar to the cut of dress for which you are shopping. 3. Make note of this and keep it by your computer when you are on-line shopping. This way, you can quickly compare a garment to your measurements that you KNOW fit and make a decision as to if it is a go or a (sob!) no! Loved this Sammy! Great post! You really hit the nail on the head, Sammy. Keep passing the word! Thanks. As always, Sammy, timely and well-written! SHARE SHARE SHARE!!! Man this is great! Your wording is so perfect! For sure that is a great idea. I have shopped at vintage stores for years with great deals and have found so many things that are beautiful. 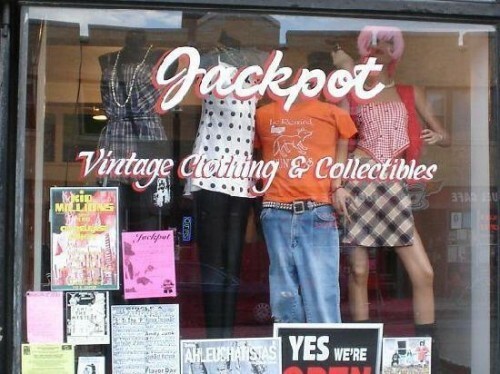 Vintage clothes are really great and unique. However, you must have patience and be willing to spend time to look around with a right attitude. It, sometimes, takes a while to find something really cool. Finding the right size could be a little challenge. Nevertheless, it can be done such as getting altered. Just remember, good stuff will not last very long, so if you see something that you love it, you should get it right away. It is actually very fun and worth it to shop for vintage clothes. You will be amazed. Good fashion sense does not mean brand new clothes, but it means how to make yourself look unique. Audrey I couldn’t have said this better myself! Thank you for affirming my believes. Self Expression = Freedom of Fashion! Great article! Thanks for the writing on this site in general, well done. 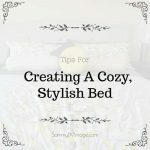 Thank you for such a well-written post! And a reminder, if you see a vintage piece you like, grab it fast ~ whether in a store or online. I can’t count how many times a customer has come back for a specific piece only to find it sold. What do you think about some stores calling themselves thriftiques like that of auh2o in nyc? They tend to have a lower price point (like say under 50 dollars) and a less curated selection. I have to wonder if this lends to the confusion to thrift stores and vintage boutiques.